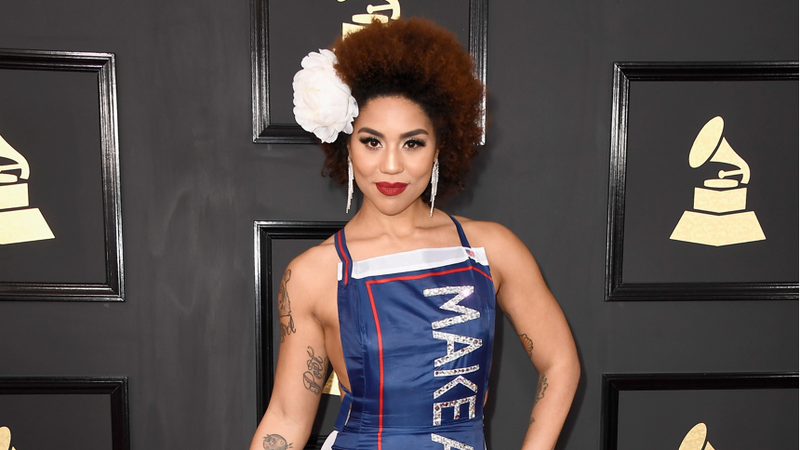 Joy Villa, a singer and potential congressional candidate, is accusing President Donald Trump’s former campaign manager of sexual assault after she says that he hit her twice on the buttocks during a November gathering in Washington, D.C.
Villa, a Trump supporter, drew copious amounts of attention at the Grammys this year after she wore a “Make America Great Again” dress. In an interview with the Associated Press, Villa said that she was at first hesitant to speak out about her interaction with Corey Lewandowski because she was fearful of the backlash. However, she has since filed a sexual assault complaint with the D.C. Metropolitan Police Department after a friend said to have witnessed the incident spoke about it publicly and another friend encouraged her to come forward. The singer, who is currently considering running for a congressional seat in Florida, said that she initially thought the incident was sexual harassment, but was told by police that touching someone on any body part that is sexual in nature actually constituted sexual assault, which is classified as a misdemeanor. “I was initially fearful to come forward with this,” she said, adding that she did not want to embarrass Lewandowski’s family or her own. As AP notes, this is not the first time Lewandowski has been facing police charges of inappropriate behavior. Back in March 2016, he was slapped with a charge of misdemeanor battery after being involved in an altercation with a female reporter at a news conference in Florida. Those charges were ultimately dropped. He was fired as Trump’s campaign manager in June 2016.